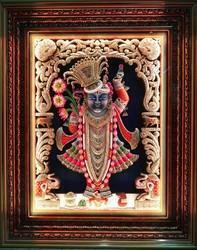 Offering you a complete choice of products which include shrinath ji painting, shrinathiji mukharvind painting, shreenathji paintings, sreenathji painting, shrinath ji mukharvind and shreenath ji painting. 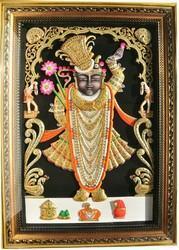 Fine Painting with gold leafing decoration on carving wooden shrinathji with frame mahaprabhu and yamuna ji pose . 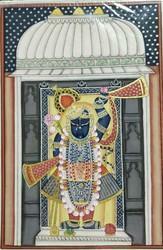 Finest collection of shrinathji paintings one can explore here in all sizes and colors , customisation welcome , We use real gold leaf for highly quality work . Swraski crystals for brighter shine and excellent quantity framing . 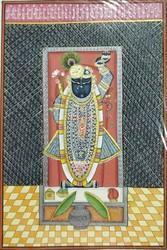 Along with safe box gift pack to home delivery. 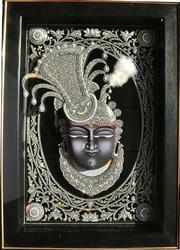 Mukharvind - Face of lord shrinathji , beautifully decorated with white embossing and Swarovski crystals . 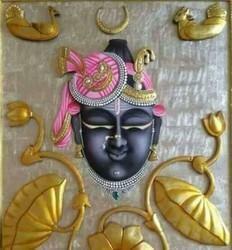 Exclusive piece of art with dedication and piece of patience , Created by artist s.l.soni Used 24ct gold n Swarovski crystals for decoration . 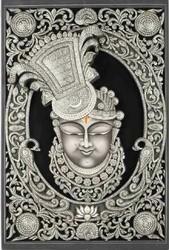 24 ct gold leafing Decoration with high quality Swarovski crystals. 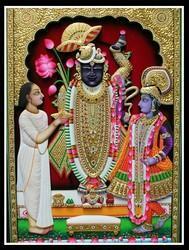 Looking for Shreenath Ji Painting ?